Solani, I didn't reply to all your posts, referring mainly to Reply #439 on: January 27, 2019. Iwill be sure to re-read it and do a quote and reply soon. That's a very interesting dream Ilinda. I've been having recurring premonitions of some suicidal individuals driving in the wrong lane in response to a financial collapse, etc. Am on heightened alert when I drive now. R.R. thanks for mentioning this to us! Just this morning I'm now reading RR's post for the first time. Yikes! It could happen and makes sense that some who are suicidal think what a fast way "out" that would be--a head-on collision. Double yikes, and watch out everyone. About two nights ago I dreamed of you, Yowbarb, and myself. Very interesting and likely to be very meaningful. We were in the front seat of a vehicle, with me on the left, but you on the right were driving. We're moving down/up the highway and were behind another car/vehicle, but I could see farther ahead on the left, in the lane of oncoming traffic. Just as I noticed a car/vehicle (on-coming) around the bend and now becoming visible, you pulled out to pass the car in front of us. I said something to the effect that "there's a car coming!". But you just continued to drive in the left/passing lane, but you were not accelerating, just driving, as if it's normal to start to pass someone, then just drive along pacing the car at the same speed. I watched the oncoming car getting closer and closer, when suddenly it veered sharply off to its left, which was our right, over on to the right shoulder. Then you continued at the same speed, pacing the car you were supposedly passing! Then here came another car in the oncoming traffic, and this one got closer and closer and did the same thing--at the last moment, it veered off onto the shoulder on the right of the car we were supposedly passing. I think I woke up after that (was relieved to get out of the stress). Several things are interesting, in the analysis of this dream, one being that even though it just did not make sense what you were doing--driving in the passing lane, or driving in the wrong lane, or not following what everyone, including myself, thought you should do, you seemed to be "holding the course" and were steady and unwavering in continuing along on your path. Another thing is that when I said, "there's a car coming! ", you didn't even comment or respond, presumably because you knew what you were doing, and maybe didn't even want to waste time trying to explain your actions. Many ways to look at this! I wonder if the "vehicles coming in our/your direction" could be meteorites that might land near you, but which will not harm you, even though people think FL is a dangerous place, right now, to "drive along the highway of life". Linda: Wow what a dream! Just got my net back on, thanks to son Wes. I will be re-reading this one for awhile. I had a couple of thoughts which I can share now ... and I will be coming back to this msg again soon. Gee! I should have said something in the dream when you were worried about oncoming traffic etc. I try to not evaluate for a person, but can't help but think we all knew one another perhaps in Great Britain. I had that feeling reading, just a few words into your msg. when you mentioned I was on the right side, driving. Well that is the UK and many former colonies! Driving on the right side of the car, in the LEFT lane. Well, I am pleased we had some kind of dream communication, sure sounds like it... Maybe you were more tuned in and aware, while I was not at the time. That might account for me not even answering, which I would never do. One other possible explanation you were sort of located in the US and I was driving like a Brit in the left lane, sort of a confusing overlap...Does sort of sound like I was being careless or maybe like some pro driver, haha. Yes, Yowbarb, you were the driver, and on the right side of front seat, and then passing the car ahead by moving over to the left lane. I think the reason you didn't say anything in response to my cautionary warning, is that you were focused on what you were doing, and you seemed to be intent and purposeful, and seemed to know exactly what you were doing. I interpreted your being on the right side of the front seat, whether you were in the driving lane initially, or in the passing lane, after pulling out, that you were/are literally on the "right" path. I was the observer, in dream, and maybe in person, observing "your path". Maybe you sensed something coming (which I obviously didn't until I saw it with my own eyes) and you knew you had better pull out and over into passing lane, because as the oncoming vehicle zoomed over on the right shoulder, we/I don't know how close it may have come to you had you stayed in your own lane. Then you continued at same speed, in same lane, (I, wondering "why? ") while the second vehicle came zooming forward and then zooming off on the right shoulder, just like the first one. You must have known or sensed their approach and somehow "knew" you had to move to that position for your own safety. And in the end, in spite of facing down two consecutive vehicles headed straight toward you, they veered off, and you remained safe, even though it appeared to an observer that you were in the wrong lane! That is another important factor in the dream--in the end, you were/are safe. Linda, I really appreciate the insight, kind words too about my being "on the right path," I feel I basically am. As far as my driving wow looks like I might have caused a lot of mayhem. Maybe the cars did represent dangers or obstacles, as you said... that would be good. If I were actually just forcing (cars with human beings in them) off the road over to the far shoulder, that would not be good, haha. In my 38 years of dream journaling and analysis, since March, 1981, I've realized that when I dream of driving down a highway or road, it has always represented my travels down the "highway of life", and when I'm a passenger, I'm observing the driver as s/he goes down his/her own "highway of life". A few years ago I dreamed I was a passenger in a car driven by a friend I'll call Helen. We were going down a dirt road, similar to the one I live on, and as Helen drove, we were driving over these huge boulders and rocks of all sizes and shapes, and OMG what a rough ride it was! Upon awakening, I realized she has a rough life, not in the sense of being "out on the streets", but she has a rough ride through life for maybe several reasons, but one I observed myself: she cannot stop spending money. She does not work, hubby does, but her hubby will caution her that "we don't have any money in the checking account" or whatever, but Helen just continues to spend, spend, spend. She will even "buy" things from places that will allow you to carry it away, and pay later. But because bills eventually come due, it creates a lot of friction and other unpleasant stuff. So, her "rocky road" in the dream was a good metaphor. "I am the car, I am the road," etc. 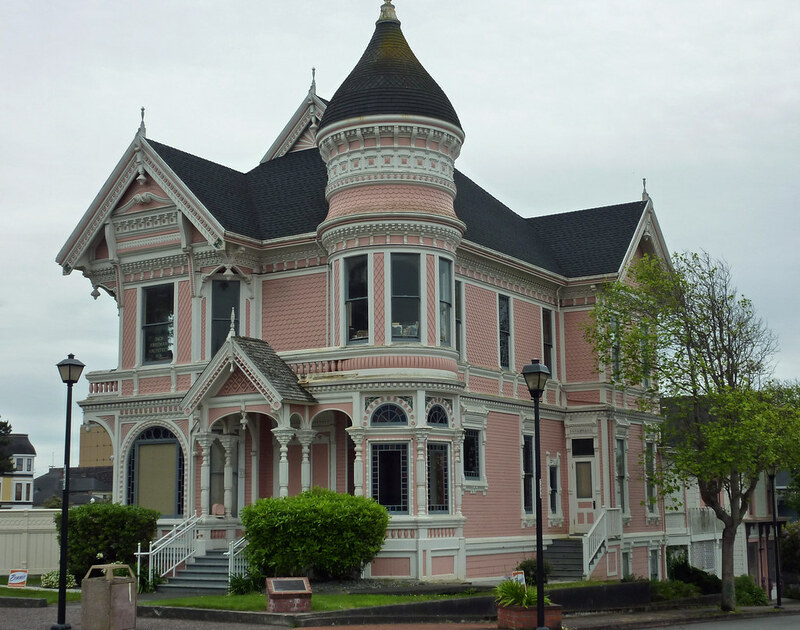 At the time that I took that course I was dating a younger fellow (by one year) who was a sophomore at the same college, and I kept having a recurring dream about a lovely old Victorian house. The guest professor helped me analyze that dream, and as I said aloud "I am a lovely old Victorian house," I realized that my subconscious mind was telling me that I was way more mature than the young man I was dating, and that it was time to seek a more suitable match, at which time my husband who is several years older than I am came along. Oh, thank you for that. That is yet another tidbit I'll add to my dream-analysis arsenal. In a sense, "I am the highway" is another way of saying "I'm traveling down this highway of life". A few years ago hubby had a long and convoluted dream, in which something was happening in one location, and then after traveling a bit farther along the same road, there was another incident, event, or thing that required his interest. Upon awakening and thinking a while, he realized that the thing "down the road" was something that was up and coming, "down the road" in time. It made perfect sense, as we all have a habit of talking of something that is just "down the road", but we know we usually don't mean it geographically. Agreed, and one theory is that any dream about travel indicates a crossroads or change of life is afoot. Very good dream analysis, BTW! Yesterday mid morning waking up, I think the dream woke me up. Crazy, cataclysmic, surrounded by death, dead and dying. It was sort of ritualistic, inevitable or planned. There was some sense to it all at the time but cannot remember. Doesn't make sense now. People were dying everywhere. I realized after a long time of seeing people pass away, that I did not and I survived and something made me spring into action, and I told one of my daughters to get out the front door and meet me. I went down an escalator and out the front and a rescue vessel (like a big white cruise ship) across the street. There were other family members in the dream. An attempted terrorist bombing at the site of our evacuation, some manhole covers blew out but did not damage the evacuation vessel. The rescue vehicle which looked like a huge cruise ship had futuristic features like super fast ramp with clear plexiglass sides on the ramp to hold on to as it zooomed up to the ship. Toward the top long flexible plastic things to grab onto, and people helping us up. Those were pink. I was waving to my daughter who was on her way to the vessel. Extremely interesting dream! Do you have the sense that the "ship" might represent a non-terrestrial ship? ""Futuristic" and plexiglass make me wonder that. Plus the terrorist attack that failed, sounds like the Cabal still at work trying to outsmart decent humans, but losing ground.